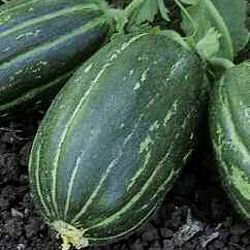 CAROSELLO (cucumus melo L.)Typical Puglia's variety, suitable fresh or in salad. Indicated for hyposodium and hypoglucose diet because it has less sugar and sodium then cucumber species. Typical variety of Puglia (Italy), which fruits are consumed raw or as salad. Middle vigorous plant with long-round fruits shape, with deep green colour and scar which mark well the slice.